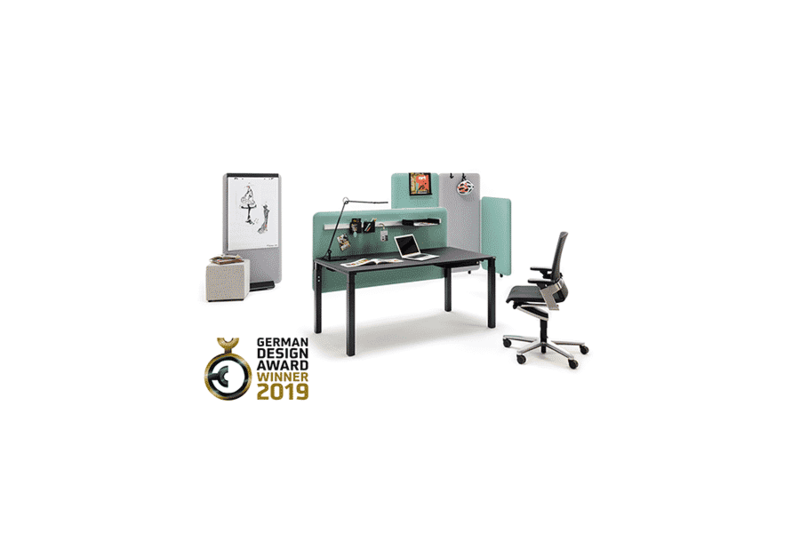 Winea Sonic by Wini is awarded as German Design Award 2019 in the category Office Furniture. The acoustic system designed by Uwe Sommerlade convinced the 45-strong international jury of the renowned design competition with its outstanding design quality. With Winea Sonic, office furniture manufacturer Wini has further expanded its product portfolio in the field of acoustic systems. The modular systems are now an important part of modern office environments, which adapt flexibly to the respective work processes and needs of employees with zoning. Thus, Winea Sonic is equally an acoustic system and room-structuring design element. It combines optimum sound absorption with maximum functionality and a contemporary, elegant design language. As a lightweight and mobile partition wall, as a desk panel or as a suspended room partition, Winea Sonic minimizes visual and acoustic disturbances in the various functional areas of an office. It enables concentrated and efficient work in a stimulating office environment with a homely ambience. With this year’s German Design Award, Wini is once again honored with one of the most recognized international design awards. The official award ceremony for the German Design Award 2019 will take place on 8 February 2019 on the occasion of the Ambiente trade fair in Frankfurt. Accompanying the award ceremony, all winners will be presented to the public in exhibitions.